The Tudor period took place between 1485 when Henry VII came to the throne (the first Tudor monarch) and 1603 when Elizabeth I died (the last Tudor monarch), this means that there were changes in the fashions from the beginning of the period to the end. This is great if you’re looking at making your own costume because you can make choices between early Tudor clothing and late Tudor clothing based on what you have available. There are also a number of famous men and women from Tudor times who you can dress up as if you choose (or you can just be a member of the court or a Tudor peasant – the choice is yours) such as Henry VIII, Cardinal Wolsey, Walter Raleigh, Anne Boleyn, Elizabeth I, or Mary I. As you can see from the image above of Mary I and Princess Elizabeth entering London in 1553 (this is when Mary entered the capital to claim her throne upon the death of their brother Edward VI) society Tudors certainly used a lot of fabric in their clothing. Whenever I think of Tudor clothing I think of sumptuous materials that also had a lot of detailing on them, embroidered by gold and silver threads and even the button details on outfits could be made from metal or jewels. Someone’s status was very tied in to how they dressed so you made sure to wear the best you possibly could …… unless you were poor that is! The Tudor peasants wore very different clothes to those in society and these were often made from scratchy wool and were certainly a lot plainer! If you’re looking at making your own costume then I would definitely look at a peasant costume as opposed to a court one! When it came to Tudor fashions for men it did change from the beginning of the Tudor era to the end, but one thing remained constant and that was hose and doublets. Hose was basically the name given for the tight-fitting trousers that they wore which are very much like leggings today. A doublet is basically like a tight fitting jacket that’s worn over their hose. In early Tudor times the look of men’s fashion sees a square shape happening as they wore coats over their doublet and hoses with big shoulders – think of a classic Henry VIII outfit. By the end of the Tudor era men’s fashions were much sleeker (think of Sir Walter Raleigh classic image) with much shorter slimline jackets being worn, along with Elizabethan ruffs around their necks. Kentwell Mid-Tudor Men’s Clothes – Kentwell Hall is a stately Tudor Mansion in Suffolk, England that holds regular Tudor Re-Creation Days, people take a lot of trouble to ensure that they do wear historically accurate clothing which is why the link is very handy for people making their own Tudor costumes. What to Wear – Men – This site is written by someone who us a UK Re-Enactor who enjoys spending a lot of time at Kenwell Re-Creation days and is sharing her knowledge of Tudor clothing for you. There really was a clear cut difference between what the aristocratic classes wore during Tudor times and what the everyday person would be wearing and it didn’t depend on what they could afford either! Henry VIII passed laws about what clothes people could wear based on their position in society for example only the King and his immediate family could wear cloth made of purple silk or gold; Dukes and Marquises could use only cloth of gold woven into their coats and doublets. When you think of men in Tudor times then Henry VIII has to be one of the first names that springs to mind doesn’t he? 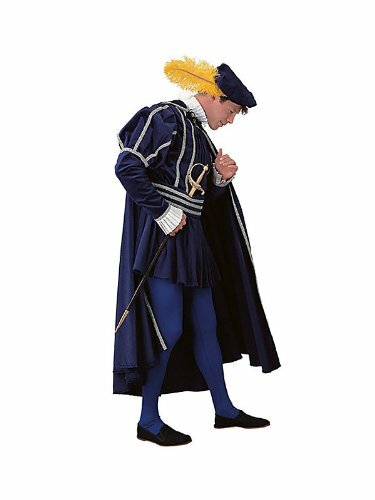 Henry VIII has certainly had a larger than life effect on history in several ways so it seems appropriate that if you’re thinking of a man’s Tudor themed costume that you would think of him and I’ve found a few costumes for you to choose from. 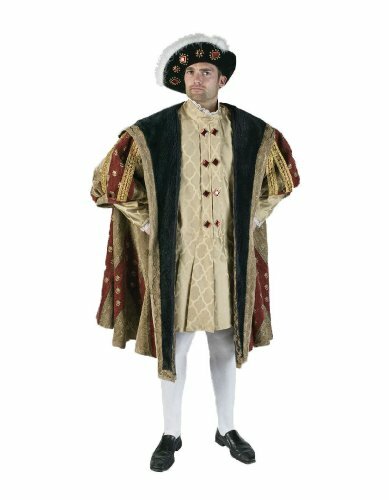 This is probably the best Henry VIII costume that I’ve seen ready to buy – it actually looks regal enough for a king and the big shoulders on the coat along with the flat cap just makes me think of Henry’s classic image. It’s certainly a very sumptuous looking costume and embraces a lot of what I think of when I think of Tudor costumes. If you’ve ever been to the Tower of London then you would have seen the Beefeaters or (as they’re officially known) the Yeoman of the Guard, these were formed during Tudor times by the head of the Tudor dynasty himself, Henry VII. The Yeoman actually have two different uniforms and the red and gold one that is worn for state occasions or when the sovereign is visiting the tower is actually referred to as the Tudor State Dress because it has changed very little since Tudor times. 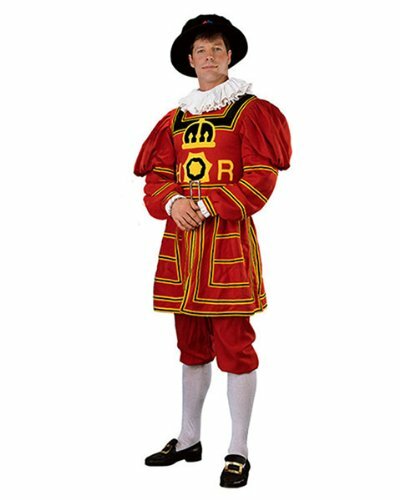 This makes a Beefeater costume a great idea as a Tudor Costume for men. This is a ready made costume that would work pretty well for a Tudor themed fancy dress costume, although it’s not an exact replica, in fact when you see the costumes side by side it’s quite obvious which is the costume! It is definitely Tudor inspired, however and I’m not sure how you’d be able to make a more accurate tunic unless you were good at embroidery as it’s really the detailing on the front of the costume that sets it apart. These next couple of costumes are based on two of William Shakespeare’s male characters – Hamlet and Romeo. William Shakespeare having been born into the Tudor era and actually performing for Elizabeth I several times at her court. I think these two costumes have a lot of Tudor fashion elements to them which makes them perfect if you want a costume that’s already been made for you and is ready to wear. 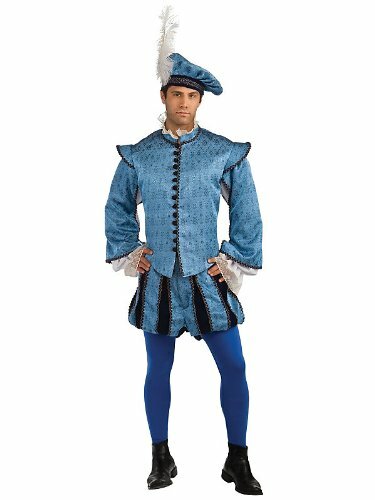 The styling of this costume is very Elizabethan in look, although the shoulders still give a nod to the squarer look favored under Henry VIII. The fitted, slimline style is totally late Tudor, court fashion though. The puff shoulders and ruffle at the neck are another classic touch associated with late Tudor fashions and this is a gorgeous looking outfit that’s sure to be a hit. As you could expect the Tudor fashion for women changed considerably over the course of the 118 years that made up the Tudor era. At the start of the era the women wore tight fitting bodices with very full kirtles and gowns resulting in a look of two triangles (stacked in an hourglass formation). On their heads they wore a coif which was attached to a cornet at the back of their head. By the end of the Tudor era women’s fashions had evolved so that their bodices were not much longer and the skirt was worn over a farthingale. The head dress had been replaced by jewels and around the neck ladies were wearing an elaborate ruff of lace. Now what are kirtles, farthingales and ruffs anyway? Let’s look at some of the words we use when we discuss Tudor fashions. The Ruff is probably the first thing that springs to mind when you think of Elizabethan ladies clothes and basically started life as a frilled collar before becoming more and more exaggerated, check out how it has evolved over the late Tudor era – Elizabethan Ruffs. The Kirtle is basically the ‘dress’ part of a ladies outfit. They had been around longer than the Tudor era as you can see here, but for help in making your own Tudor Kirtle you’ll want to check out this fantastic site – Making the Kirtle. The Fathingale is basically a circular frame worn under a skirt to hold the skirt out. The one that is usually associated with Tudor fashions is the Spanish Fathingale, usually stiffened with willow, this frame was made popular by Catherine of Aragon when she first arrived in England to marry Prince Arthur (Henry VIII’s older brother) and ironically Catherine Parr (Henry’s last wife who outlived him, Catherine of Aragon was his first who he divorced) is seen to be wearing one in her portraits. What to Wear – Woman – this site contains some great information on what constitutes a great Tudor costume and is written by a UK Re-Enactor who has spent quite a bit of time at Kentwell on their Tudor Re-Creation days. How to Create a Green Tudor Gown – follow this lady as she shows you her inspiration for a Tudor gown and how she constructed it. 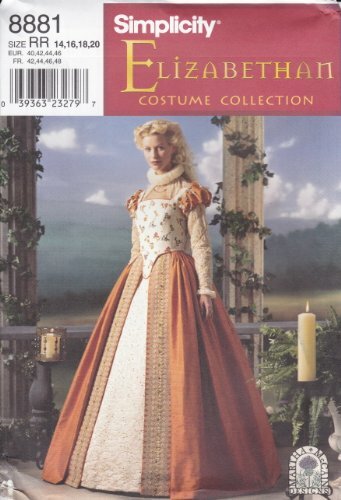 Now a number of people who want truly historically accurate costumes weren’t that happy with this pattern, but one person decided to use it as a template and then produced a page explaining how to improve the pattern by yourself and produce a wonderful Tudor gown that any re-enactor would love to wear. How to Alter the Simplicity 8881 Pattern for a Better Period Gown. Although Henry VIII was married six times in total the wife most people seem to think of when they think of him is Anne Boleyn, probably because she has been held responsible in the history books for causing Henry to split with the Catholic church and appoint himself head of the Church of England. Of course things were a little more complex than that, but this page is about costumes. It should come as no surprise that the only costumes I could find for any of Henry’s Queens were for Anne Boleyn and there were a few to choose from. I do like the look of this costume (although it’s presently out of stock) as it seems very in keeping with portraits we have of Anne Boleyn – the square neckline of the gown and the sleeves that become wider at the end. I would combine this gown with a French Hood as that was Anne’s favored head dress to wear. How to Make a French Hood – this article explains how you can make your own French Hood to compliment this gorgeous gown and complete your Anne Boleyn costume. This next two costumes actually include the head dress as well as the gown which is a lot easier if you just want to be able to buy a ready made outfit. The first one is one that I’ve always liked and you could make even more authentic by making a replica of her famous ‘B’ pendant and adding a couple of other long gold chains around her neck as well. The second outfit doesn’t look like a Farthingate style of ‘hoop’ is being worn so the skirts don’t seem quite as full as with the other costumes, I also don’t think it looks quite as good around the sleeves so I would definitely pick one of the other two outfits I’ve selected if I were to be wearing them. As we move on through the Tudor era towards the reign of Anne’s daughter Elizabeth lace starts to be incorporated more and more in ladies outfits. We see Mary I wearing a little lace at her throat and by the time Elizabeth takes the throne the Elizabethan Ruff is the look that we always associate with the fashion of the court at that time. Henry VIII’s first wife, daughter of the Catholic Monarchs was Katherine of Aragon and this page will help you to make your very own Katherine outfit from the Gable head dress to the square-necked Tudor gown. This website has been compiled by a reenactor who has an array of tips and information for making your own Tudor outfits. Learn about the type of jewelry the Tudors wore and what gemstones were used. I do love the fashions of the Tudor era from the early Tudor fashions right through to those amazing Elizabethan Ruffs (although I think the really big ones may have been really annoying to wear!). I love the idea of making my very own Tudor costume, but I’m probably more likely (if I’m honest) to buy one ready made! This entry was posted in Costumes and tagged anne boelyn costume ideas, medieval costume ideas, renaissance costume ideas, tudor costume ideas by Lou. Bookmark the permalink.